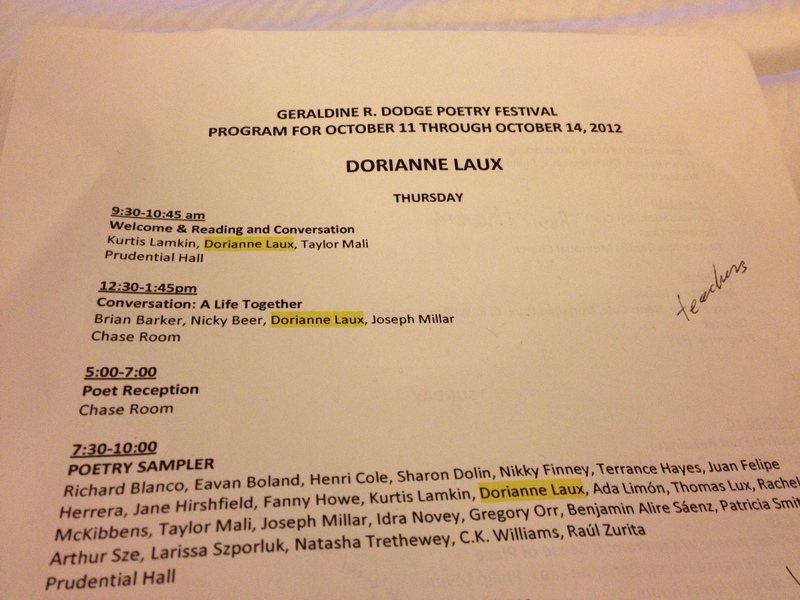 I had planed to keep a daily journal of my impressions of The Dodge Poetry Festival, but was so tired each night I could hardly keep my eyes open. I don’t know how many people attended this year, though the festival usually draws around 12 to 15 thousand. Thank gawd it’s biennial. I don’t know how they would plan such a massive undertaking without the break of a year between events. The first time I ever went to the Dodge Poetry Festival I traveled there in a car with my friends, The Grubins: Dave, Joan and their daughter poet Eve Grubin. I was unfamiliar with New York, and so had no idea in what direction we were headed. But soon the city seemed to slip away and when the car stopped and we stepped out, we stood in a dirt parking lot the size of Detroit. I could not believe it. I remember asking Eve, “Every car in this lot is here for poetry?” Yes, she said as she took my astonished hand and lead me to the tents. This was Waterloo: Valhalla for poets. Except we were all alive! What used to be a circus tent, mud and boots affair, has now moved to the streets of downtown Newark’s Arts District where poetry lovers stroll, fast-walk, or flat out run from one event to another. The day is packed with panels, talks and readings, as well as music and food. Books are for sale by every poet there as well as poets from former festivals. Literally hundreds of thousands of poetry books are stacked in rows 10 deep on the fold out tables, as well as Dodge Fest merch: t-shirts, mugs, baseball hats and jerseys, all with the Dodge logo proudly displayed. One woman I spoke with said that when she filled out her form for the suggestions box, she asked, “Why not scarves?”. It was getting chilly by the end of the fest so I feel sure I would have snagged one. It’s really too much to take it, or to do justice in so few words. If you are a poet or a reader of poetry, it’s one of those things you must journey to at least once in your life. When I give a poetry reading, I’m still amazed that anyone shows up. Why would you stop watching TV or shut down your computer to go listen to someone read a poem? But they do, in droves. Some buy four-day passes so they won’t miss a word. The first time I attended the Waterloo Dodge, I was there to listen to poets I revered, like Stanley Kunitz, Lucille Clifton, Gerald Stern, Sharon Olds, Galway Kinnell, Philip Levine, Stephen Dunn, C.K. 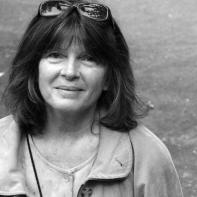 Williams, as well as newer poets I’d come to love Li-Young Lee, Marie Howe, Mark Doty, Tony Hoagland. Nothing prepared me for the sound of 3000 people settling into folding chairs as Stanely Kunitz began his slow walk across the stage. When he reached the microphone, the sudden quiet was so loud I could hear the tent top high above us billowing in the breeze. And as he spoke, the silence grew around his voice, the poem knitting itself into the air. When it was over, the silence sat a moment longer, still and close, and then the applause rose up to fill the void like sudden light through tall windows. The other moment among the many moments I’ll never forget was when Marie introduced me to Stanley before the reading. I was shy, worried about what to say. I was shocked that the body that housed this great voice was so thin and fragile, and when he stood up I wanted to say no, don’t. But his eyes shone and he gripped my hand in his and planted a soft sweet kiss on my cheek. I blushed like a girl. For days, I did not wash my face.